It's January. In this part of the country that means temps can fluctuate between what feels like -36°F and 45°F. These are not ideal conditions to have your furnace to go on the fritz. But your furnace doesn't really care and proves it to you by acting up during, arguably, the coldest time of year here. You call a furnace repairman only to find out he's swamped and can't get to your house until tomorrow. Here are 5 ways to troubleshoot your broken furnace in the meantime. 1. Is The Thermostat Set To Heat? Things happen. A button may have accidentally been pushed. Someone may have brushed the thermostat as they walked by... It seems like a no-brainer, but you would be remiss to not rule it out. Make sure your switch is not in the 'off' or 'cool' setting, but sitting squarely in the 'heat' setting. 2. Are The Batteries Dead? While you're at the thermostat, check the batteries. Some thermostats are hardwired into your home's electrical system. Others require batteries. If yours takes batteries, try changing them. 3. Is The Air Filter Filthy? The sole duty of your air filter is to clean the incoming air of dirt and debris. 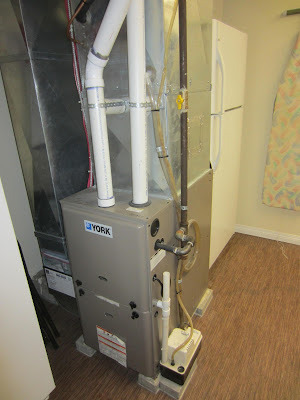 If it becomes so filthy it's clogged, it restricts airflow to the furnace. This leads to heat and pressure buildup. 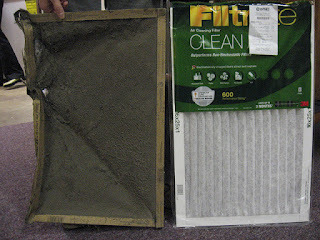 So, check your filter, if it appears dirty, make a trip to the hardware store for a replacement. 4. Is A Breaker Tripped? Head to your breaker box and make sure your furnace breaker isn't tripped. 5. Is Your Pilot Light Lit? Older model furnaces (20 years or more) have a pilot light which remains lit full-time. Occasionally the light goes out for one reason or another. Relighting it is a fairly straightforward process that all homeowners should be capable of. Simply follow the directions in your owners manual. If none of these fix the problem, your best bet is to plug in some space heaters and wait for your furnace repairman. Here's a VERY IMPORTANT TIP: when temps are hovering at or below freezing, be sure to open all of your cabinet doors and turn on your faucets to a trickle to prevent water pipes from freezing up. This will save you costly repairs on plumbing.